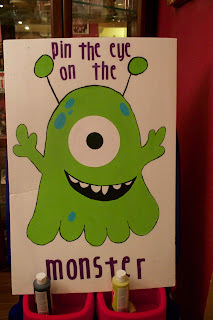 I am putting together all the decorations for Dexter's first birthday party and decided that I wanted to make a "Pin the Eye on the Monster" game. I went digging around on Google and Pinterest but couldn't find anything that I was super in love with, so I just made up my own little guy. And now I want to show you guys how to do it on your own! Think of this as a poor excuse for a tutorial! 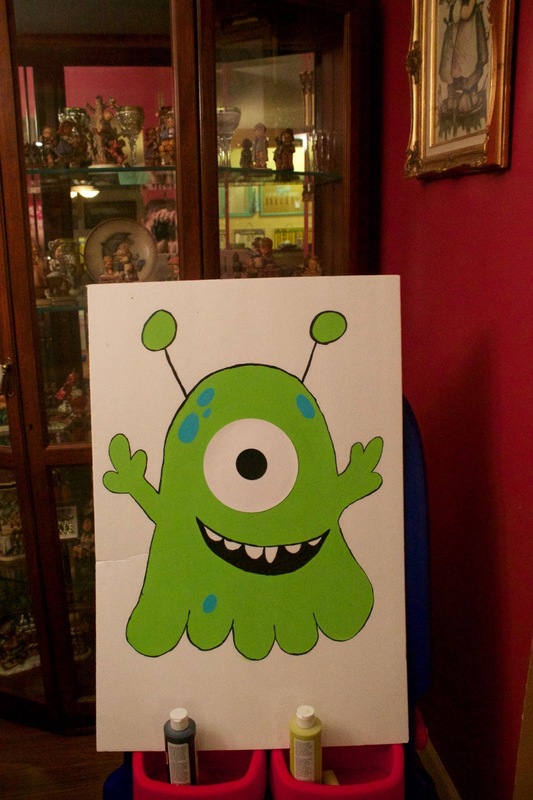 First, sketch out your monster. There isn't a right or a wrong way of doing this, you just have to let your inner monster come out. Now you need a color. I decided I wanted my monster to be green, but he aso needed blue freckles, maybe your monster needs to be blue with red freckles. Maybe your monster doesn't even need freckles. But I feel any monster worth painting needs freckles. I also outlined him with some black paint and filled in his mouth. I just freehanded the teeth, and honestly, he's a monster, straight teeth are not necessary. When I was done painting, I went to my cricut machine and cut out two circles, one white (5" diameter) and one black (2" diameter). I then glued it with my glue stick to my liking. You could do two eyes, three eyes or you could use large googly eyes. Or you could paint the eye(s). Really it's up to you which you choose to do! After all that, I cut out the letters for my sign. You don't have to do this. Or you can paint it. Or you can buy letter stickers at your craft store. I just happen to have the cricut so I was able to cut out the letters. Last but not least, I cut out 6 more eyes and glued them together to make the "pinning" eyes. And so there you go, a pretty awesome game for Dexter's party, and it cost me just over $1 since I had all the supplies except the poster board. Very Clever!! !.......And such a good likeness of me!!! So cute! 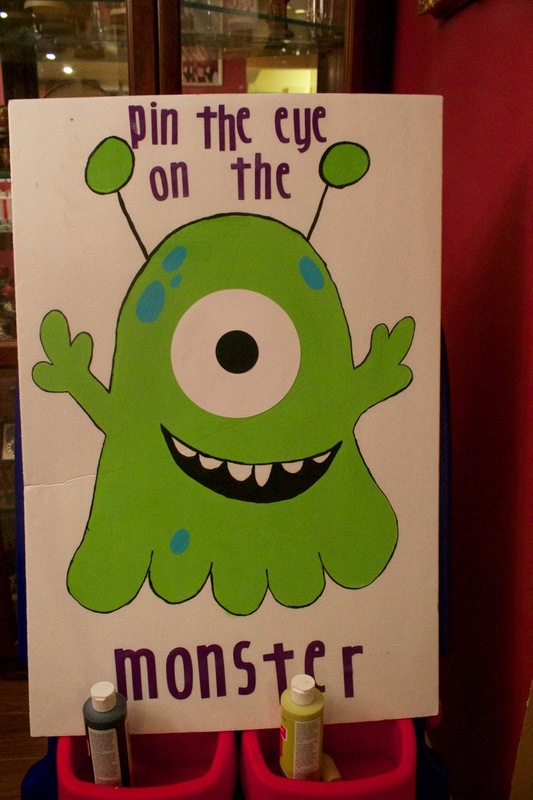 I love how adorable your little monster turned out! He looks fab - love it! This is really cute! 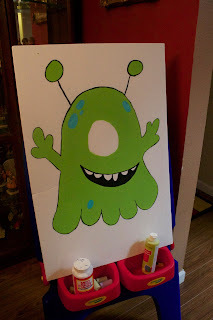 What a fun twist to a classic party game :) Thanks for sharing at The Weekly Creative link party!